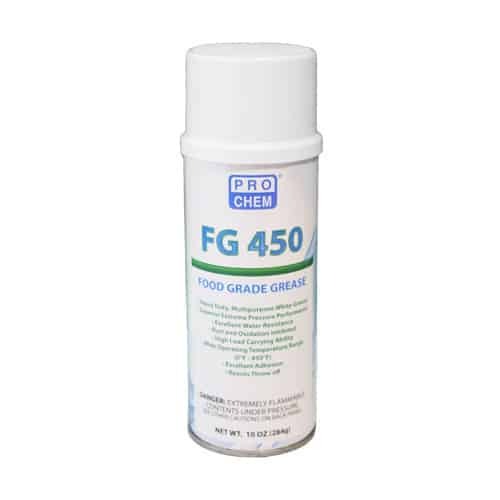 FG 450 | Pro Chem, Inc.
FG 450 is an ultra-polymer structured white food grease. It is extremely durable and strong with high loading carrying capabilities. It has excellent water and steam resistance. It has outstanding adhesion and resists throw off. This product protects against rust and has a high operating temperature range. It is safe to be used in areas with incidental food contact and around food processing areas. Spray a thin film on surface to be lubricated. For pinpoint application, insert extension tube into actuator. Shake before use.